Here are eight of the long guns that played a role in making the American Civil War the bloodiest conflict in our country’s history. What were the top long guns from the American Civil War? The American Civil War still remains the deadliest conflict in our nation’s history. The most widely accepted figure estimates 620,000 men lost their lives in the four years of war. However, new research pegs it higher at 750,000, even 850,000. Even on the low estimates, the number of American dead from this single conflict was massive, and was not equaled in combined death toll of all other American wars until Vietnam. Disease in an era before antibiotics was the main culprit to these horrendous figures, more than 2 percent of the country’s population then. But weaponry advancements also played a large role. More accurate firearms, able to be fired at a higher rate, combined with outdated military tactics to pulverize vast swaths of men in the blue and the gray. To get a better handle on exactly why this seminal war was as bloody as it was, here are the 8 Long Guns You Have to Know from the American Civil War. The first mass-produced American rifled musket, the 1861 was the most utilized long arm of the Civil War. 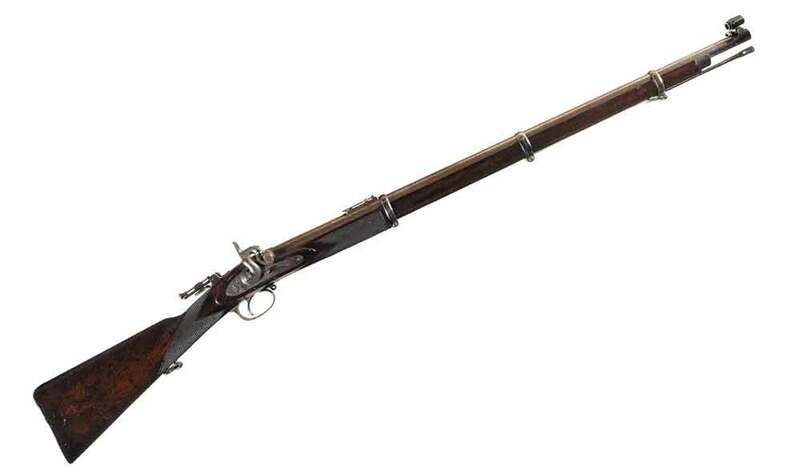 The rifled musket was the dominant military long-gun design of the day and, as its name suggests, was a stepping stone between the musket and rifle. Like the musket, the projectile was smaller than the bore, allowing for fast loading, even when the arm was fouled with black-powder residue. But unlike previous iterations of the musket, the bore was rifled, which allowed the Model 1861 and its ilk to take full advantage of a deadly new technology — the Minié ball. The conical projectile, developed by French Army officer Claude-Etienne Minié in 1849, delivered before then unheard-of accuracy to military long guns. Captain James H. Burton improved the American Minié ball fired by the Springfield by hollowing the base of the soft-lead bullet. This allowed the projectile to expand upon firing and take hold of the rifling, and in turn stabilize and be truly accurate. Both Union and Confederate armies used this accuracy to devastating effect, flinging the .58-caliber, 500-grain Minié balls at each other from up to 500 yards out. Engagements, however, generally happened at much closer range, making the 1861 all the more deadly. 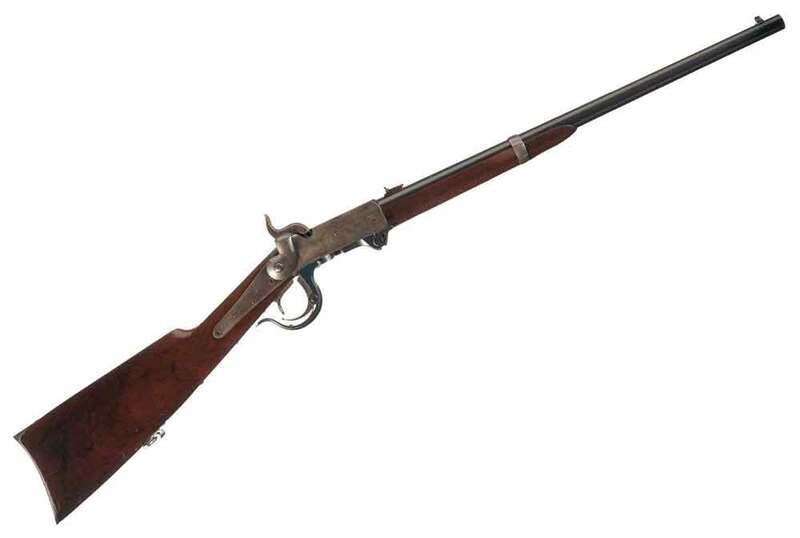 The 9-pound, 40-inch-barreled Model 1861 was also a more reliable weapon than preceding military arms through the use of percussion caps. Despite these improvements, the Springfield’s rate of fire was similar to a musket’s, around three aimed shots per minute. Good thing, too, because battlefield surgeons already had their hands more than full at the pace soldiers were being wounded and killed by the Model 1861. Considered by many to be the premier Minié-style rifled musket of the day, the Pattern 1853 Enfield could readily outperform its counterparts on the battlefield. The British-made arm, the primary long gun of the Empire at the time, proved effective out to 900 yards, 400 yards farther than almost any other rifled musket in the Civil War. While both sides used the 1853, it was a particularly important arm in Confederates’ hodgepodge arsenal. Given the South’s smaller manufacturing base compared to the North, it was imperative it import arms. England became one of the Rebels’ main arms dealers, with a number of small private gunmakers from around London and Birmingham supplying up to 350,000 Pattern 1853s. This was not Britain’s first go-around with a rifle bound to shoot Minié-style projectiles. Instead, the .58-caliber rifle (it shot a .577-caliber Minié ball) was an improvement on larger-bore predecessors. The rifled musket had a 39-inch barrel attached to a walnut stock by three barrel bands, leading it to be called an “Enfield three band” by some. The rifle was used as early as the Battle of Shiloh in 1862 and was a staple long gun through to the final battles of the war. The Lorenz was a bit like playing craps, if craps entailed being killed if the dice were faulty. Nevertheless, the rifles were heavily imported with an estimated 350,000 making their way into the hands of both Union and Confederate soldiers. Christian Sharps’ falling-block still stirs the hearts of marksmen today. And why not? Not only is the Sharps perhaps one of the most elegant rifles to come out of the Civil War era, it also performed. There are numerous accounts of Union soldiers connecting shots from just shy of 1,000 yards with the revolutionary Sharps. But it took some doing to get the rifle variation into the hands of the 1st and 2nd Regiments of U.S. Sharpshooters. It is said Gen. Hiram Berdan had to circumvent his superiors and essentially appeal to President Lincoln himself to get the Sharps in play. The Sharps Carbine, on the other hand, had no such problems. The firearm was the most used carbine of the war and the most commonly carried by Union cavalry, with some 90,000 produced. The .52-caliber’s self-contained cartridges could be easily loaded on horseback, giving a mounted soldier a weapon that had an effective rate of fire of 8 to 10 shots a minute. Shooting 475-grain bullets, that’s a lot of lead down range. The Sharps continued to make history after the war. Chambered in the powerful .45-70 Government, the rifle was the choice of many commercial buffalo hunters on the American frontier. And it can still be found harvesting game today. Similar to the Pattern 1853, this was another British import the Confederates relied upon, mainly their sharpshooters. And it might be one of the most unique long-gun designs of the war, and perhaps overall firearms history. That is, if you consider a gun designed to fire hexagonal bullets a bit odd. Sir Joseph Whitworth was the man behind the machine, inspired by cannon design in conceiving his polygonal rifled long gun. His goal was to build a replacement for the Pattern 1853. He certainly built a gun that outperformed it, at one trial striking targets at 2,000 yards, 600 yards better than the Enfield. Despite the rifle’s impressive capabilities the British military did not adopt the .451-caliber Whitworth. Serendipitously, Sir Whitworth found another market for his rifle at the outset of the American Civil War — the Confederates. Despite somewhat limited use, the muzzleloader still reached mythological status with Rebel sharpshooters who achieved some truly astounding shots with the rifle, and in the process struck terror into Union troops. Prohibitive cost, however, stymied wider adoption. Where a domestically produced rifle would cost around $25, a cased Whitworth with 1,000 rounds of ammunition would cost a stunning $1,000. In a conflict dominated by muzzleloaders and single-shot rifles, the Spencer Repeating Rifle had to have seemed like a godsend. With seven rounds of .56-56 Spencer rimfire on tap, the rifle delivered overwhelming firepower for the time. While perhaps not as fast between shots as other repeaters that made their appearance in the Civil War — it had to be manually cocked — the Spencer was perhaps the most reliable. Christopher Spencer’s design limited the chance of dirt and other obstructions from rendering the carbine non-functional, an important feature for a rifle bound for battle. The tubular magazine in the buttstock was quick on the reload too, particularly with the aid of a Blakeslee cartridge tube, which made its appearance later in the war. While mainly a Union firearm, a few did fall into the hands of the Confederates. And despite its overall popularity with the troops, few of the rifle variation made it into their hands. Only 13,000 Spencer rifles were purchased by the Union. The Spencer carbine, on the other hand, was widely utilized, with around 90,000 being produced for the war effort. Behind the Sharps, it was the most used cavalry carbine of the war. Besides being known for his poor generalship, stylish facial hair and being the first president of the NRA, Ambrose Burnside was also a firearms innovator. In the early 1850s, Burnside resigned his military commission to work exclusively on his breech-loading carbine design. The .54-caliber turned out to be a boon for the Union cavalry, giving them a quick-to-reload firearm, built to withstand the trials of battle. The single-shot rotating-block carbine utilized one of the breakthrough firearms technologies of the time — the self-contained cartridge. Though, its strange conical-shaped cartridge could occasionally get stuck in the breech after firing. Even with this flaw, the Burnside went on to become the third most used carbine of the war, behind the Sharps and Spencer, seeing action in nearly every battle in the conflict. The rifle potentially had another downside however. It is suggested by some that the Burnside Carbine was what vaulted Burnside the man to the upper ranks of the Union Army and on to debacles in the Battle of Fredericksburg and the Battle of the Crater. The “rifle that you could load on Sunday and shoot all week long” was a boon to the soldier who could get his hands on one. But there were relatively few that did. Officially, less than 2,000 of the revolutionary, lever-action repeating rifles were procured by the Union. But the Henry made its way into Civil War lore through soldiers spending their own hard-earned pay on the brass-receiver beasts. Some Confederates got a hold of Henry rifles too, but faced the same problem they did when they captured a Sharps or a Spencer — ammunition. Once they shot what they had on hand, there was no way to replenish their supplies, given the ammo manufacturers were based in the North. With 16+1 rounds of .44 Henry rimfire ammunition on tap, the rifle would have been money well spent. As with the Spencer, it provided overwhelming firepower in a conflict dominated by muzzleloaders. But the 24-inch, 9-pound brainchild of Benjamin Henry did have its weak points. Its external tubular magazine could get fouled or damaged, which was trouble for a weapon that’s advantage was rate of fire. And the .44 round was relatively weaker compared to the dominant repeater of the time, the Spencer. But even with those drawbacks, it’s hard to argue that a soldier with a Henry in his hands didn’t have a great advantage over nearly any enemy he met.